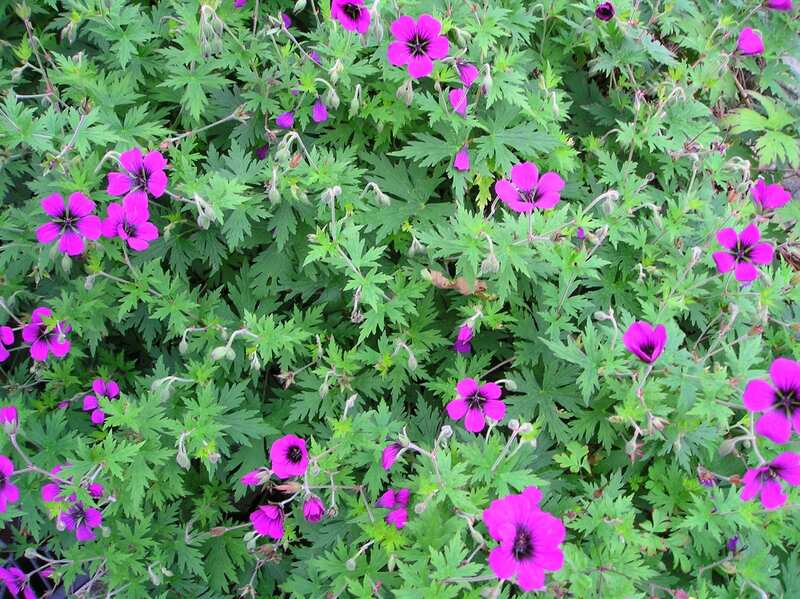 A geranium hybrid with golden-green foliage in spring and bright purple, black-eyed flowers all summer. This lovely Geranium scrambles happily across borders and into shrubs. It is a spreader so leave it plenty or room. Discovered by Rev. Folkard, in Norflok, and named after his daughter. This cranesbill looks spectacular in a pot and offers good autumn colour. Good ground cover or happy growing over walls or down banks. Most geraniums are slug and snail proof, versatile and easy to grow, being tolerant of a wide range of conditions and all soil types. Cut back hard in spring, to within a 15cm/6in of the crown. This hybrid is sterile and sets no seed so can only be propagated by division.